It’s been another busy month in the craft room, with magazine features, Create & Craft shows and, of course, the Christmas collections arriving. A selection of my Let’s Celebrate cards appear in the current issue of Papercraft Essentials magazine, in a ‘Cut Out and Keep’ section so you can refer to them again and again for layout ideas for any of your First Edition papers. I think this paper pad is going to be one I refer to time and time again with its fun imagery and versatile colour palette. I am also working on a feature for Die Cutting Essentials magazine’s September issue – which happens to come out on my birthday - using the First Edition build a scene Christmas dies in a modern way and using an unconventional Christmas colour scheme so look out for that! I have also been working with the new Little Red Robin Christmas collection from Dovecraft. I am sure this is going to be a favourite among crafters with its traditional elements combined with modern embellishments. Who is going to be able to resist that Felt Robin topper? In fact there are so many lovely embellishments in this collection, all of which will combine beautifully with your existing craft stash or any Christmas embellishments you have left over from last year. As far as I am concerned, that’s reason enough to treat yourself to the whole collection! My other craft projects have been samples for the latest First Edition paper pads, Fiesta Fever and Perfect Moments, which were both available on Create & Craft this month. I put two bumper craft bundles together, combining stamps, dies, inks, complementary papers and adhesive gems or pearls, as these are the type of things I would use in conjunction with my First Edition papers. 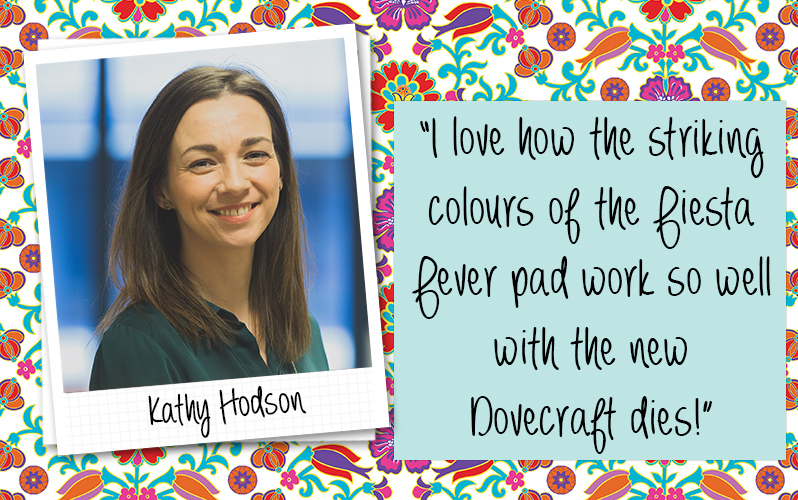 I love how the striking colours of the Fiesta Fever pad work so well with the new Dovecraft dies, and the Perfect Moments paper pads are ideal for romantic occasions. If you didn’t catch my Facebook Live demo where I demonstrated how to create cute table gifts using these papers, you can find it on the Create & Craft Facebook page.